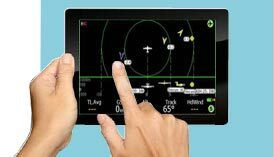 AirWhere has been designed to offer a lightweight, flexible and cheap approach to pilot awareness. Currently we offer the use of various flight software namely LK8000, XCsoar, XCTrack and FlySkyHy to connect to the unit, more flight software compatibility coming soon. We are always still developing the software, adding new features, fixing any issues, feedback is welcomed! Please use the contact us page. You fly with a tiny box in your pocket, on your flight deck or integrated into your flight computer. We will mainly be discussing XCSoar or LK8000 running on a smartphone, Kobo or Tablet so its worth familiarising yourself with this software. This is the AirWhere Unit and it contains a microprocessor and a radio transmitter/receiver. Your flight hardware ie Kobo, android phone, iphone etc is linked by WiFi or Bluetooth or directly wired to the AirWhere box. It sends your GPS position to the box and this is sent on via the Radio Link to other AirWhere boxes and/or a ground station. This can be up to 20km away! We have seen 30km in testing but this is rare, our record to a ground station is 80km, let us know if you beat this ! This information is then processed by AirWhere and this displays on your Kobo or Android System. The information is usually in the form of a triangle on screen with a number next to it showing the other pilots climb tate, more information can be retrieved by various screens on the flight software. Imagine being on a cross country flight and knowing that there is another pilot 5km away and being able to see his climb rate, you can basically be told about thermals from many km away. If you are accidently sucked up into cloud with an XC flying buddy, then you will be able to see each other on screen and safety avoid each other, this in itself is worth building or buying a system! With your wifi hotspot on or in range of a ground station, your position will be logged on the internet, this will help with retrieves, for safety and to show people where you are at. The AirWhere unit itself pulls around 120mA - 150ma so when powered with a normal external battery pack of 5-6000 maH, batteries will last many hours. While initially it was a soldering and self build task to build AirWhere, we now off a "off the shelf" product for around £20, this in conjuction with your flight instrument will run the system, how can you afford not to have all these features and facilities for just £20!! The project has moved in a new direction now, the initial concept of just the air to air tracking. We now have moved to a new chip ( its still only £5 to buy ) but we now have an accelerometer based vario, sounds, barometric pressure, temperature for an extra £10. Therefore we have a full setup for around £50 to build. 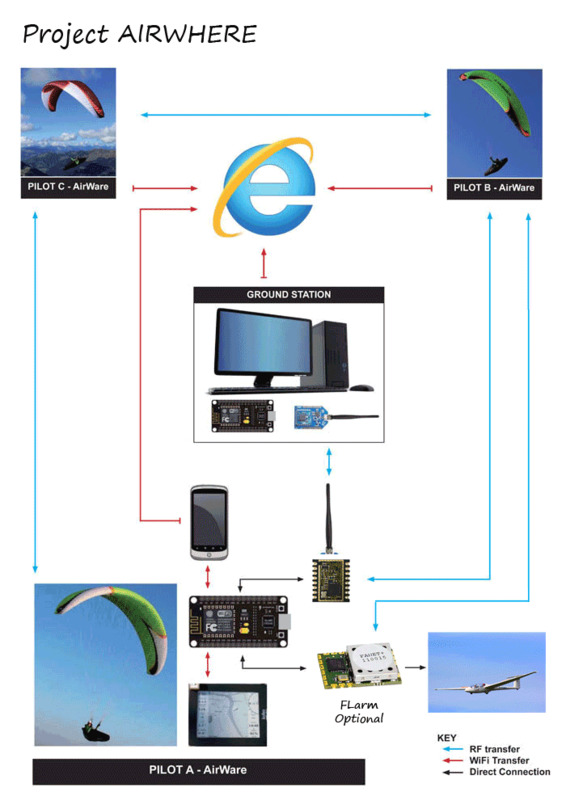 This can be coupled with a smart phone running LK8000, XCSoar, FlyskyHy or similar to give you a complete setup. We hope this will help bring a complete flight instrument to everyone. Hopefully soon we will have these to purchase aswell for around £100, or a kit for self building. We already are compatible with two manufacturers who are bringing out a commercial version of their own AirWhere - We will be compatible with this so we can all see each other. If you are a manufacturer who would like to get involved and produce their own verison we have a software libary you can install on your unit and then add the £8 RF LORA chip and then you will be seen by everyone and part of the system - this is free and very easy to get involved. Hope you have fun with the project.